Additional notes on “A Forgotten HTTP Invisibility Cloak” talk! 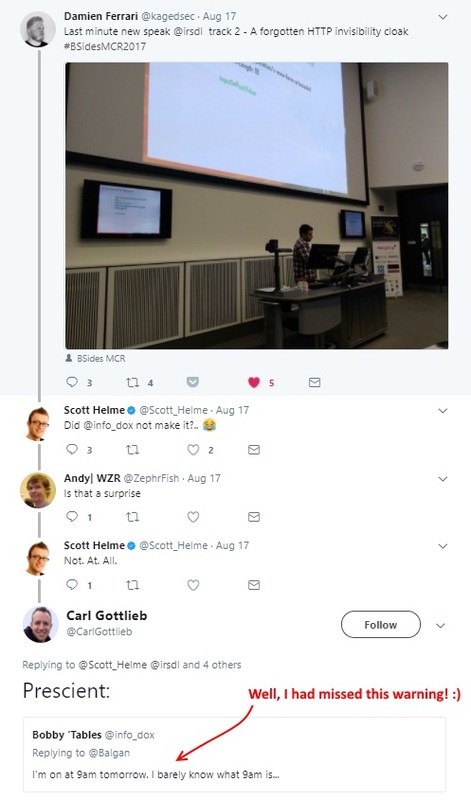 As I could not share the video for my BSides Manchester 2017 talk due to naming a few vendors, I thought the best plan was to explain a few things in a casual blog post. Most of the techniques explained in the presentation were not new although I did not know that initially! In some cases, I was 15 years late to the bypass partei; therefore, I have included links in the references for those who want to read more about them. I should mention that the request encoding technique is particularly the one I am proud of, as I still have not seen it anywhere else. The http.ninja website is currently linked to a Github repository that contains the Python code I had used to perform the initial tests on my targets. My plan is to update this website with a cheat-sheet of different setups and different test cases. If you have an open source template in mind that can help me with this, please let me know via my Twitter. These are not the only methods; some other documented behaviours can be seen in https://drive.google.com/file/d/0B5Tqp73kQStQU1diV1Y0dzd1QU0/view. That said, there are probably loads of other test cases that I have not tried yet and will be a great area for research. Some of the methods explained in this slide could help us bypass protections that were based on the application path or the parameters. HTTP v0.9 with full header supports on Apache Tomcat is a lovely feature/bug that can confuse loads of WAFs. This method was only useful for those of us who were testing IIS. It was not really necessary to do so in order to bypass the WAFs as shown on the next slides. The last boundary “- -1- -” could be fully removed if it was a PHP application on Apache or IIS or on Nginx-uWSGI-Django-Python2/3 setup. There is just some space characters after the “filename” and before the “=” sign. This is to make it an invalid file upload request and therefore it would remain a normal POST request parameter as before. This mutation on its own can bypass some famous cloud-based WAFs. If charset was used before the boundary, a comma character should have been used as the delimiter between them. Otherwise, a semicolon character should have separated them. Slideshare has changed the encoded values incorrectly. To see the actual values, you can view them in the PDF file of the presentation. If you are using Burp Suite or other web proxies, ensure that the auto update Content-Length feature is disabled. Fun fact: HTTP Pipelining can be used to exploit DoS issues, smuggle HTTP requests, or to exploit race condition flaws. However, that is not all it can do! Although I am not giving anybody any ideas, HTTP Pipelining can help you to book your precious online ticket faster than others. This is when you need to send more than one request to book your ticket but the following requests do not use a parameter taken from the previous responses. This entry was posted in Security Posts and tagged bsides manchester, conference, request encoding, WAF bypass on September 1, 2017 by Soroush Dalili.